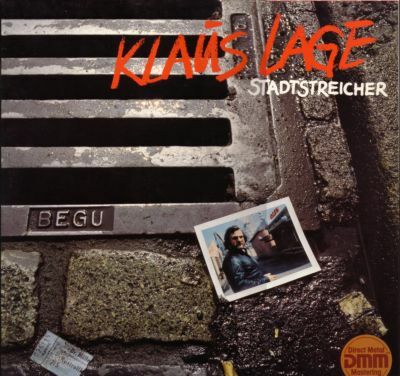 STADTSTREICHER (which translates to something along the lines of "city hobo"), Klaus Lage's third album, shows him to be a more confident musician than on his previous two releases: his blues-based pub rock is louder and rockier this time around, the songs are more serious, and the political and social commentary has moved more into the foreground. Working again with his band Druck, Lage performs a number of songs that tell stories of people who feel disconnected -- with the city, their surroundings, or themselves. In the title track, the protagonist is disillusioned with the city he lives in; the balladesque "Mamas Liebling" (Mommy's Darling) is about a young man living on his own, away from the orderly lifestyle provided by his parents; in the intense "Fang neu an" (Start from Scratch), a man arrives in a new city, separated from his wife and daughter (halfway into the song, the lyrics reveal the man to be a musician named Klaus -- but of course, it remains unclear just how personal the song really is). Even "Mit meinen Augen" (With My Eyes) is an upbeat pop song which became a hit single; it deals with a relationship people disapprove of. Contrasting the personal stories are a number of political songs showing the presence of lyricist Dieter Dehm (who was the head of the Musikant label Lage was signed to, and who later became a politician). The record opens with a cover of Wolf Biermann's "Und wir hatten keine Höhle" (And We Had No Cave); there is the up-tempo rocker "Kandidat" (Candidate) about the downfall of a political candidate indicated by the run-down look of his old election posters, and even "Transit," which resembles a deadpan send-up of the weary trucker romanticism of Gunter Gabriel and his ilk, is set before the background of a divided Berlin. As on his debut album, Lage performs two international covers with German lyrics: Bob Seger's "Fire Down Below" becomes "Feuer unterm Gürtel," and Bob Dylan's "Three Angels" is translated to "Drei Engel" (its German lyrics provided by BAP founder Wolfgang Niedecken) -- but the renditions aren't strictly played for humor in the way Lage's take on Lennon's "I'm the Walrus" was: the Seger song sounds harsh, and the Dylan cover is darker than the original. As on POSITIV, the music itself isn't too original -- most of it could be easily covered by Huey Lewis or any down-to-earth rock band playing in a bar around the corner -- but Lage never intended his music to be edgy or experimental. The language of his (and especially Dehm's) lyrics is often simple and direct, which some people feel uncomfortable with, but while there is little poetry, there is oftentimes a strong story told unsentimentally and in well-observed details. Lage clearly feels more secure throughout STADTSTREICHER than on his previous albums, but while most tracks are worthwhile (especially "Fang neu an"), some of the songs aren't strong enough to be memorable ("Wochenend," the Seger cover). The production is slicker than before, and the rock part of Lage's songwriter/pop/rock mixture is stronger than before, but it would still take another year before he'd get everything right and deliver his massive hit album SCHWEISSPERLEN, combining spot-on storytelling with an effortless pop/pock sensibility. This review was written for the All-Music Guide on January 13, 2008.